Kariba Ferry to Matusadona Zimbabwe. Kariba is once again our departure point for our next destination - Matusadona National Park. 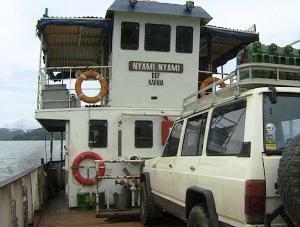 Kariba Ferries operates a ferry service across the lake on their car ferry Sea Lion and its sister Ferry Sea Horse. The 280-km trip across the lake takes approximately 24 hours. 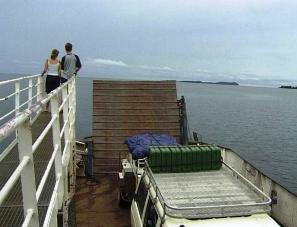 It has two departure points, one from Kariba itself at the eastern end and the other from Mlibizi at the western end. 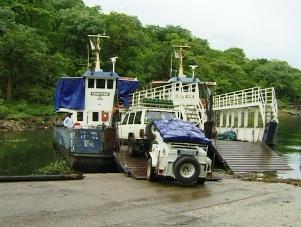 The government-run DDF -- which stands for District Development Fund-Shipping service ferry operates scheduled ferry trips to various destinations on the lake. The best way to visit Matusadona is to charter a ferry from DDF. This 50-km trip will take about 4 -- 5 hours depending on the whether. Normally by road the park is reached via Karoi. Eight km north of Karoi on the Harare/Lusaka road turn left through the Urungwe Communal Land.115 km from Karoi, the Sanyati River is crossed. Continue on along the Binga road for a further 62-km and then turn right and continue on for 82 km to Tashinga, which is the headquarters for the park. From Kariba this route is more than 400-km long and can take up to a full day to cover. From Karoi the roads are either gravel or dirt. The last 80- km is rough and not suitable for saloon cars, and during the rainy season the road could be impassable even in 4x4 vehicles. The trip on the ferry is more enjoyable though, as you can sit back and relax while you ease your way out over the lake. As you leave Kariba behind small islands appear on the horizon as the captain skillfully manoeuvres the craft on its route. Dozens of houseboats and other smaller craft are encountered on your way. No wonder Kariba is known as Zimbabwe's Riviera. Lake Kariba is recognised by many as the tourist paradise of Zimbabwe. It is 280 km in length and supports a large population of people and animals along the shoreline. A wide range of activities are on offer to the visitor -- game viewing, boating, sailing, water-skiing, scuba diving and houseboat cruises. But it is the fishing that is probably the most sought after activity, particularly the fighting Tiger fish. Wildlife in the area is prolific and elephant and buffalo are common sights along the shoreline. Other species, which one can see, are impala, waterbuck, zebra and sable. Bird life is varied and includes many water birds such as herons and egrets as well as large numbers of fish eagles. Visitors can also hire one of the many houseboats available at Kariba. This is the ideal fishing holiday, cruising slowly up and down the lake, stopping to fish at will, and enjoying the spectacular sunsets whilst the captain carefully moors the boat for the evening. The Matusadona National Park lies along the southern shores of the Lake and the Department of National Parks provides several campsites within the park. In addition there are many top quality safari operators in this area offering small, exclusive camps staffed with professional guides to take visitors on game drives, walking or fishing.